If there is one coin you want to get your hands on as a collector, it’s the first-year production of a popular coin series. The Silver Somalian Elephant is an extremely popular coin right now, due in large part to low mintage levels and changing designs each year. 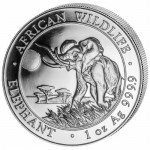 Right now, Silver.com has the 2004 1 oz Silver Somalian Elephant Coin available for purchase. Mintage of only 5,000 coins! Face value of 1,000 Shillings (Somalia). Unique design not featured again on an African Wildlife coin. Silver Somalian Elephant coins were first produced in 1999 by the Bavarian State Mint with Zambia as the nation of issue. From 1999 to 2003, the coins were struck for Zambia. In 2004, the series shifted to Somalia with new designs introduced each year. Part of the African Wildlife Series, each year the coins feature the world’s largest land mammal on the reverse. As 2004 was the first production year for these coins, it is hard to come by these 2004 1 oz Silver Somalian Elephant Coins in Brilliant Uncirculated condition. A BU coin has no signs of wear and tear, but may show breaks in the luster, spotted surfaces, or contact marks from striking. Adding to the value of this coin, production of these coins in 2004 was limited to just 5,000 in total. On the reverse is the unique 2004 design of the African elephant. In the image, a male bull elephant is featured stomping through a thicket of brush. Engravings include “Elephant,” “African Wildlife,” and the coin’s weight, metal content, and purity.eatures two leopards holding a heraldic shield, upon which a single star sits in front of a set of horizontal lines. 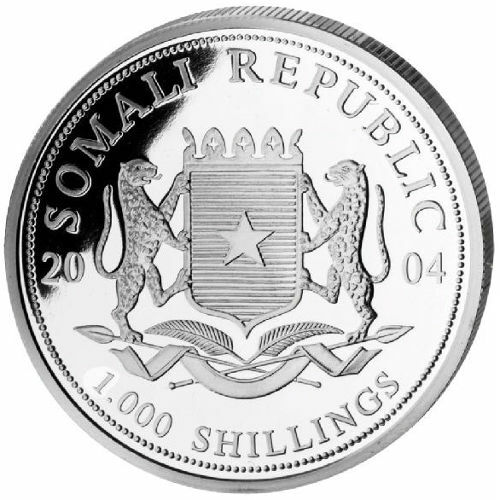 This emblem is the official coat of arms for Somalia, and is encircled by engravings of “Somali Republic,” the coin’s year of minting, and the face value. Bavarian State Mint is a state-owned entity of the Free State of Bavaria, and is one of the five official sovereign mints in Germany. It is one of the few in Europe authorized to produce the Eurozone’s common currency, the Euro (€). Please direct all of your questions to a Silver.com associate at 888-989-7223. We’re also conveniently available online through our live web chat service and email. If you are looking for similar products, visit our Silver Somalian Coins page.